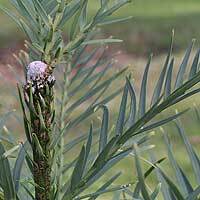 Only rediscovered recently the Wollemi pine is now readily available for sale and once established, it is easy care. Gardeners have taken to this living fossil and are growing it containers as well as in the ground. Used as a feature tree in a container it is grown on verandahs and patios where its unique appearance attracts attention. It will grow happily in these conditions, however will need repotting after 4 – 5 years. This is best down in winter, and be careful not to overpot. The main problems gardeners seem to face is root problems due to poor drainage and / or overwatering. One of the problems some gardeners face if yellowing or brown leaves. This can be caused by a number of factors. To much sun on new foliage. A little Wollemi pine History. Wollemi pine (Wollemia nobilis) is remarkable tree discovered only recently and now recognised as one of the worlds oldest species. Thanks to commercial propagation this interesting specimen is now available for sale at specialist nurseries. In its natural habitat the Wollemii Pine can reach 40m and more, in cultivation it is difficult to tell, however we would assume a fair bit shorter perhaps to 20m. However in a container and with some pruning in winter months growth can easily be controlled. Care is not difficult given a moist soil but well drained soil, full sun to part shade, and this wonderful tree is well suited to growing inputs or containers given appropriate water. Newly planted trees can suffer a little yellowing of the foliage in full sun, however they will recover once established. In a well lit position this tree could also be grown indoors. A low phosphorus fertilizer in slow release form is adequate.